Also known as the blue city and the sun city, Jodhpur is the foodie city of Rajasthan. In the sweltering heat of June, when the average temperature is above 42 degree Celsius, we visited Jodhpur to explore the local food. We had no contact in the city but with the firm determination and passion for food exploration, we asked a few locals about the places to eat and we must say, all the recommended places were amazing. 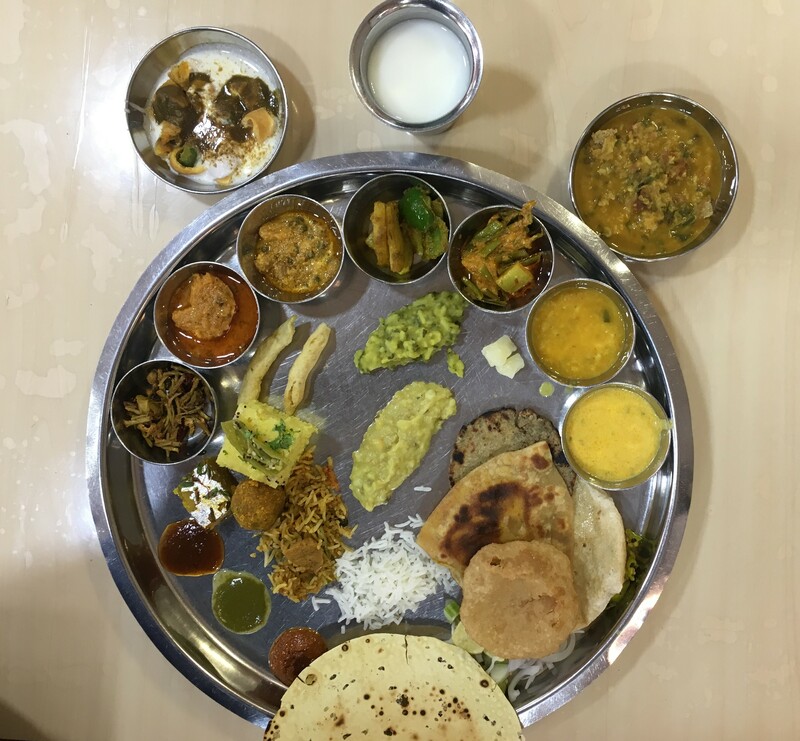 The Jodhpur food journey started with a famous thali restaurant in Jodhpur- Gypsy restaurant in Sardarpura. I believe thali really captures the essence of ‘Indianness’. With so much of variety in one plate, it changes from one place to another. At Gyspy, the standard thali was a mix of dishes from Rajasthan and Gujarat. There were approximately 35 dishes that were served one by one. The servers talk to each other in sign language. 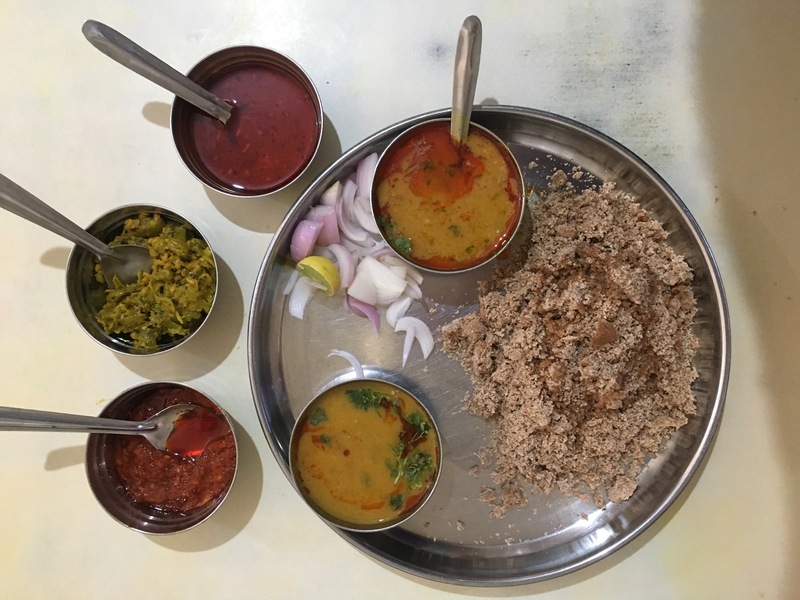 What is unique to jodhpuri thali is mirchi vada chaat, ker sangri, gwar phali, and gatte ki sabzi. 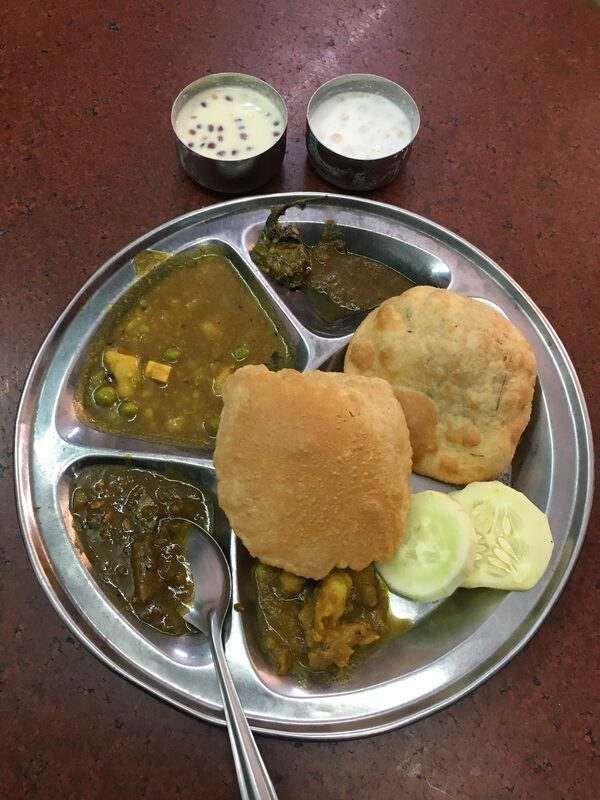 Priced at INR 400, this was the best vegetarian thali, I have had in a long time. After having our fill at Gypsy, it was time for a cup of strong tea. We stopped at Bhati tea stall, the best tea shop in Jodhpur. In the evening, we headed out to try mirchi vada at Surya Namkeen near Jalori Gate circle. 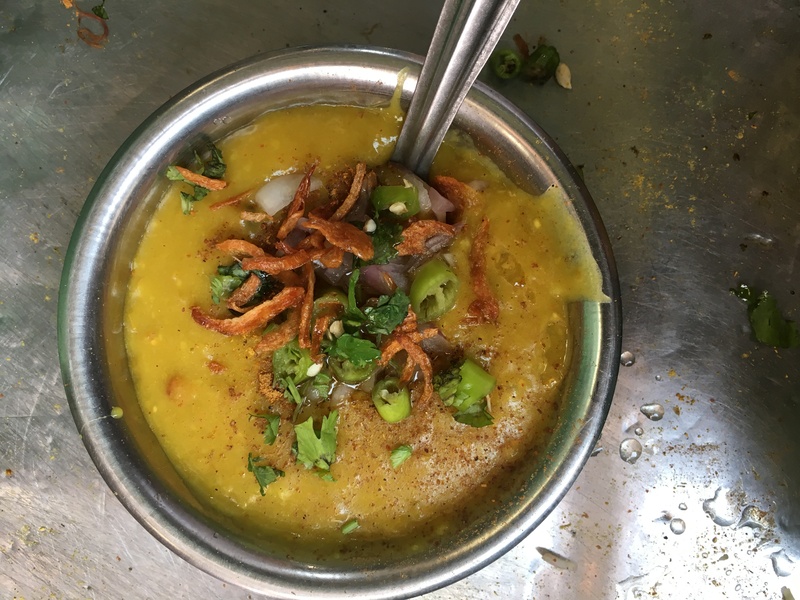 This is one dish that defines the street food of Jodhpur. A big size green chilli is wrapped with spicy mixture of mashed potatoes, then drenched in the batter of chickpea flour, and finally, deep fried in oil. The locals enjoy it with a slice of white bread as it balances the spiciness of the chilli. Next, we went on a full-on street food tour near Ghantaghar. We started with Arora’s famous dahi gunja. A man with a big moustache, Mr Arora, worked as a school van driver for many years but his passion to cook made him start this shop near Ghantaghar. Dahi Gunja is simply a dahi vada that is stuffed with ginger, and cashews. The chaat is topped with sev, and fried palak patta. It had all the flavours which a perfect chaat should have- sweet, spicy, and tangy. Just next to Arora chaat bhandar is Shahi Samosa shop. Not my favourite but the locals highly recommended it. It was simply aloo samosa with a small piece of cashew in it. The addition of cashew makes it royal that’s why they are known as shahi samosas. At the entrance of Ghantaghar is another shop named Mishrilal, famous for its Lassi. The shop was established in 1927 by Late Shri Mishrilal ji Arora at sardar market, Girdikot. It started with a small set up of selling namkeen kachori and kofta. Later from 1960, Radheyshyam Arora and his son Rajendra Arora began making a special lassi and named it ‘Makhaniya lassi’. I had tried lassi at many places in India but this was quite a unique in flavour. 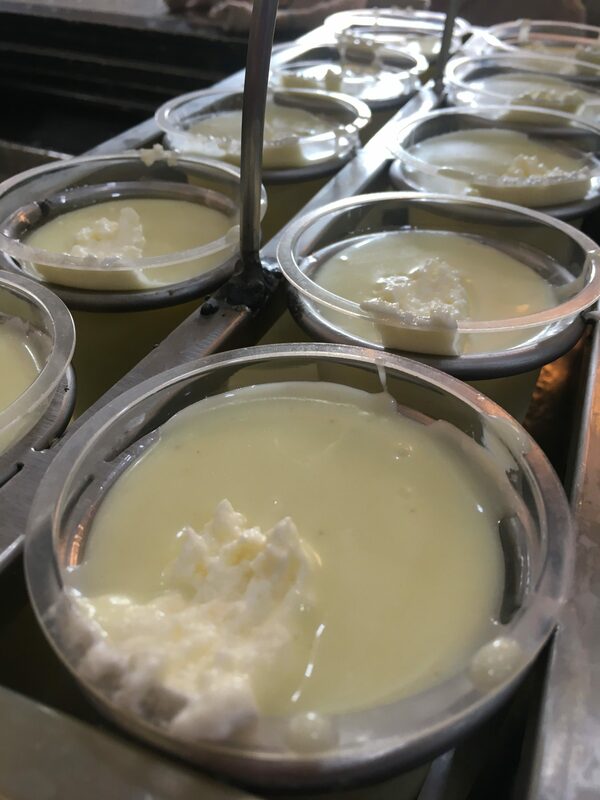 Prepared with highly compressed curd and ingredients like cardamom, kewda and sugar, it tasted more like shrikhand. Next morning, Dr Navneet, our friend in Jodhpur took us on a food tour in the Old city. Old city is the place where you get the real deal. The first stop was Narayan Mishthan Bhandar near Rakhi house for kachori. I must say this was the best kachori I’ve ever had. Normally, the kachoris are a bit doughy in texture with no filling at all and most of the shops add spicy thick potato curry to enhance the taste. At Narayan’s it was deep fried in ghee. Fried to perfection, it was literally melt -in- mouth or should we say real khasta kachori. It doesn’t require any chutney to eat. All the sweets at Narayan are made in ghee. We also tried fresh malpuas. Those were delicious too! Meandering the lanes of Jodhpur, out next stop was Chaturbhuj Rameshchandra for Gulab jamun. The shop is in Kandoi bazar. This lane has many shops selling the khoya or mawa for making sweets. And the names of all shops are Chaturbhuj, with all of them selling the same stuff. However, Dr Navneet took us to the right spot for the soft and sweet Gulab jamun. We also tried two other sweets there – mishri goonga (milk solids stuffed with sugar crystals) and mawa chakki (similar to Kalakand in texture). Kanji vada is another dish popular in Marwar region of Rajasthan. Vadas made up of moong dal are immersed or soaked in mustard water locally known as ‘rai ka paani’ or ‘kanji’. Before being relished, the mixture is fermented for a day. Kanji is the perfect refreshing drink that aids digestion and protects you from the heat. Brijwasi chaat bhandar is the shop to savour kanji bade in Jodhpur. It was time for sweets after spicy and tangy kanji vadas. We started with Rabri ke laddu. The name itself sounds mouthwatering! Instead of water, thick condensed milk is used to prepare the batter of chickpea flour. Once the boondi is fried, it is soaked in sugar syrup. The result is the thick and sticky texture of laddu. They are given a round shape but it can not be held in the hand. It is so soft that it unfurls. A super delicious delicacy available at Mohanji sweets, Aada Bazar, Inside Jalori Gate. The staple food or the comfort food of Rajasthan is Daal baati. We had always tried it in thali restaurants but this was the first time I tried it at a specialised restaurant known for daal baati and churma laddu. More common in the countryside of Rajasthan, baati is simply a dumpling made up of whole wheat flour, baked in coal. They are served with mixed lentils, spicy garlic red chilli chutney and green chilli pickles. We tried Dal baati at Bhawani Daal Baati shop near Nasrani Cinema hall, Chopasni road. We also visited the kitchen where baatis are made. Hygienically prepared, the baatis are baked in an electrical oven. It was interesting to see the electrical baati crusher. 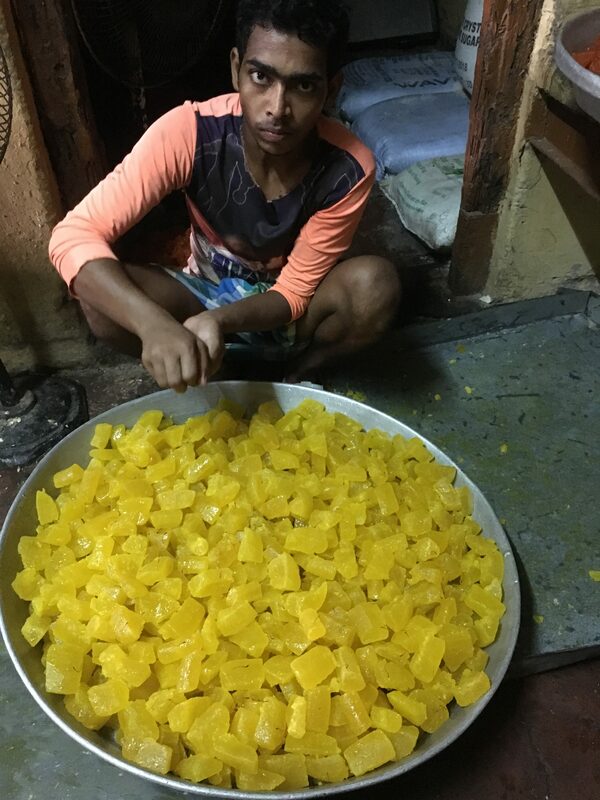 Instead of using the hands to crush the baati, they are put inside a crusher and you get finely ground baati to be easily mixed with dal and chutney. The churma laddu, again made up of whole wheat flour with sugar, ghee and nuts was to die for. The highlight of Jodhpur food tour was Malai ki roti, qabuli, gulabjamun ki sabzi. In the evening, we again went to the Old city to a place where one can taste malai ki roti. Malai ki roti is similar to papuri/malai poori in Puri, Odisha or malai gilori of ram ashray in lucknow. But what makes it special? The speciality is that the texture is completely different from other places. Cow milk is used for this preparation. The milk is constantly boiled until you get a thick layer of cream on the top, that’s why, the locals call it roti. Once the roti is prepared they are soaked in sugar syrup and sprinkled with saffron water, cardamom, almonds and pistachios. 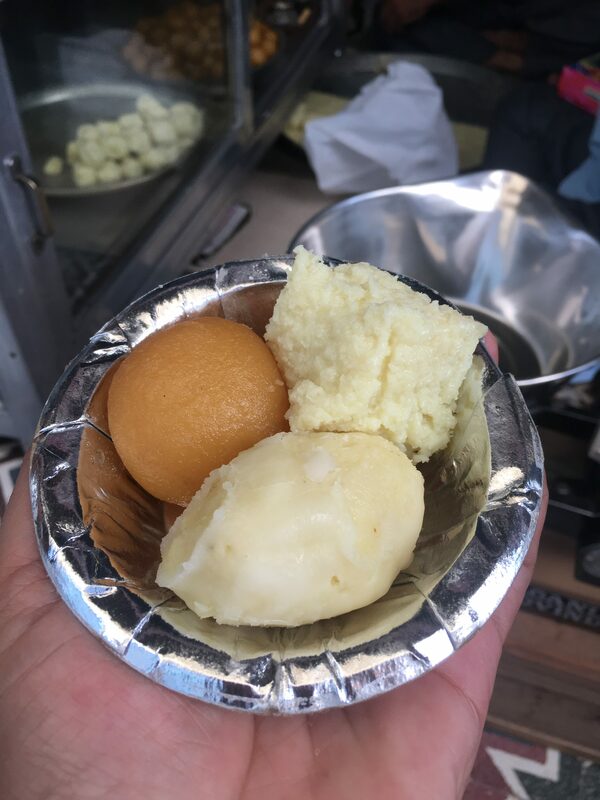 I must confess, I am a big fan of traditional Indian milk-based sweets ranging from Mathura’s khurchan to malai gilori in Lucknow. With just simple ingredients, we have so much of variety of sweets. India is truly a land of sweets. Another dish that intrigued me was gulab jamun ki sabzi. At first instance, I couldn’t believe that one can make sabzi out of sweet gulabjamun. Later, I came to know that the gulab jamuns are not soaked in sugar syrup they are simply cooked in curry paste. Most of the sweet shops in Jodhpur sell gulab jamun without adding them to the sugar syrup. If you deconstruct the gulab jamun, it is just khoya that is deep fried. If added in the curry, it gives a bit of malai kofta texture. It was delicious. 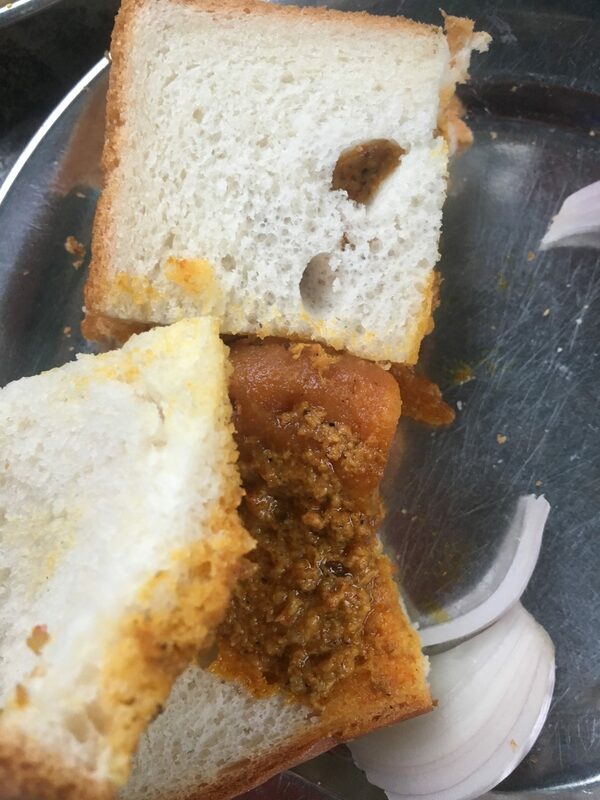 The sandwich was again made with thick gulabjamun sabzi. In two slices of bread, a generous helping of sabzi is stuffed and then cut into two halves. The last dish we tried here was Jodhpuri kabuli pulav- a rich rice preparation with mix vegetables and dry fruits. The best food cart to savour all of this opposite Kunj Bihari Temple, Katla Bazar. Finally, it was time for some non-vegetarian food and we visited 2 places recommended by Dr Navneet. 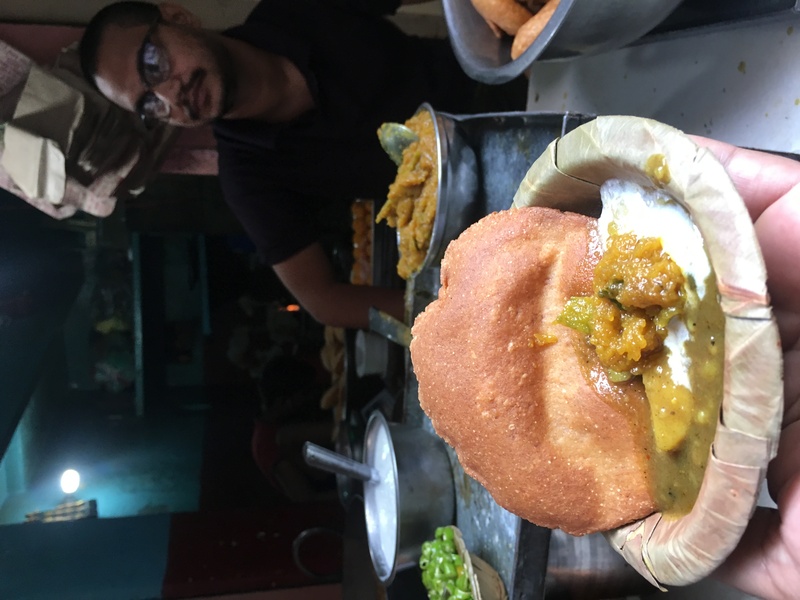 Although, the most famous Rajasthani non-veg delicacy is lal maas and junglee maas, we gave it a miss in jodhpur instead tried the street dishes. We tried chicken silly at Al Baik – a deep fried chicken in the batter of corn flour and eggs. And Kashmiri chicken at Jammu and Kashmir hotel near railway reservation counter in Jodhpur. No way related to Kashmiri cuisine, I wonder why named it Kashmiri chicken. 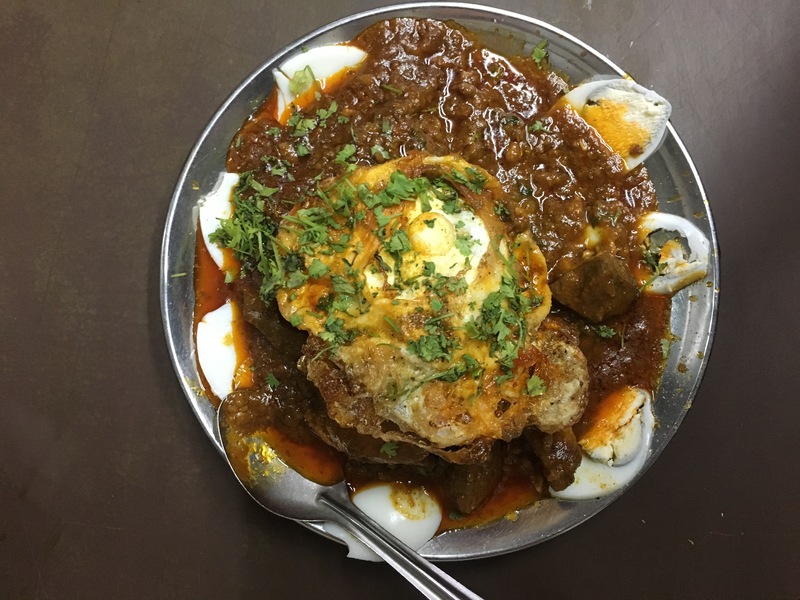 It was chicken cooked in mutton keema gravy topped with double fried egg. Spicy but truly delicious, I moped the thick keema gravy with fresh and crispy tandoori rotis. Jodhpur also has a lively street food culture. Near shastri circle, every evening food carts sell street food from all over India at one place – from paani puri to vada pav, you get them all. I tried the girlfriend chaat- a super spicy cup filled with tamarind sauce, amchur powder and spices. Not my kind of chaat, but a popular amongst the locals. After exploring few of the food stalls, we ended our food journey at Marwar kulfi cart. Truly a place that steals every foodie’s heart! As much as the breakfast food trail across Agra filled me up, it also left me wanting to not miss out on the other unexplored gems. Tahir obliged and took me to the next stop on our gastronomical journey; Ram Babu Paranthe Waale, in Sikandra on NH-2. This place has been serving its flavours, both old and new, drenched in Ghee for the past 87 years. From old favourites such as potato and mix-veg paranthas, to crowd pullers like maggi and chocolate, and bizarre ones like pomegranate and apples, their menu has several varieties of stuffing for you pick from and surprise your taste-buds. We decided to get out hands on a classic mix-veg parantha, penne pasta parantha, and the Maggi parantha. Be prepared to throw your diets in the backseat while visiting this place, since each of these paranthas is fried in a thick pan, drenched in around a hundred grams of ghee and served with aaloo-matar sabzi (potato and green pea curry), some kadhi, pumpkin dish, some tamarind chutney, and pickle. 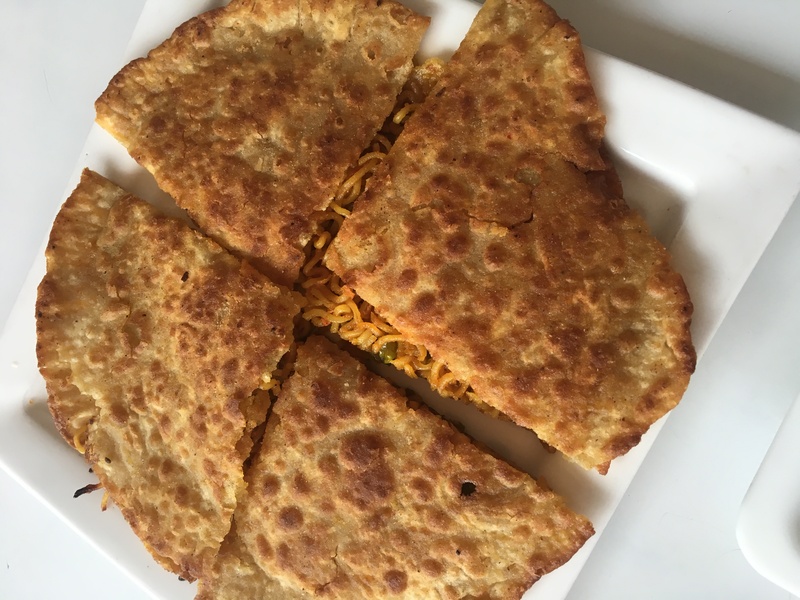 We first tried the Maggi parantha, which is especially popular among the young customers. The stuffing had green-peas, chopped carrots, and some extra masalas to amp up the heat. It was spicy and got us excited to move on to our mix-veg parantha. This was stuffed with green-peas, carrots, onions, and potatoes. The preparation was so crisp that we could hear it crackle as we dug into it. Last came our penne pasta stuffed parantha. The pasta was tossed in desi masalas and topped with some cream. The fried pie-like result was then generously coated with grated cheese making it taste like nothing short of a pizza with a north-Indian twist. This 87-year-old restaurant displays a perfect picture of the long way that the Indian food-culture, has come with 32 kinds of paranthas in its menu. They plan to add 36 more varieties and keep the menu ever-evolving. Our adventures continued as we reached a neat and unconventionally fancy, lit up Chai Tapri serving Tandoori Chai. The chai is served in Kulhad, a clay utensil, often used to serve drinks in. The Kulhads are heated up over coals in a tandoor. Fresh milk-tea is then poured in these glistening-red clay-mugs, making the Chai boil and bubble up; and taking in the distinct, earthen smell and aroma of the mud. The chai, perhaps a bit-sweet to please the taste of the locals, has a nice flavour of cardamom and ginger. Agra sent my way a wave of unexpected innovation while still keeping the essence of the original, making me wonder what more the city has to offer.